Starting on 14 September 2013, the Hermitage Amsterdam will turn its attention to three great French artists of the late nineteenth and early twentieth centuries: Gauguin, Bonnard and Denis. In the years following the breakthrough of Impressionism, they went in search of new artistic paths. The elusive Paul Gauguin (1848–1903) was a shining example for the introverted Pierre Bonnard (1867–1947) and the theoretician Maurice Denis (1870–1943). Bonnard and Denis were briefly united with a few other artists (such as Valloton and Vuillars) under the name of Les Nabis, after the Hebrew word for ‘prophet’. These young artists explored fascinating new artistic paths. Unlike the Impressionists, who aimed primarily to capture the fleeting qualities of natural light, the Nabis emphasised colour, feeling, symbolism and imagination. Their work was quickly embraced in Paris, and in Moscow. The work of the Nabis will be exhibited side by side with French paintings and drawings by their predecessors, contemporaries and immediate successors. With a small selection of sculptures by Auguste Rodin, Auguste Maillol and Paul Auguste Bartholomé, the exhibition will reveal the many facets of Paris’s flourishing artistic climate in the 1890s. The term ‘Nabis’ was first used in 1889, by a group of young artists in search of a new approach to painting. They were studying together at the Académie Julian in Paris. 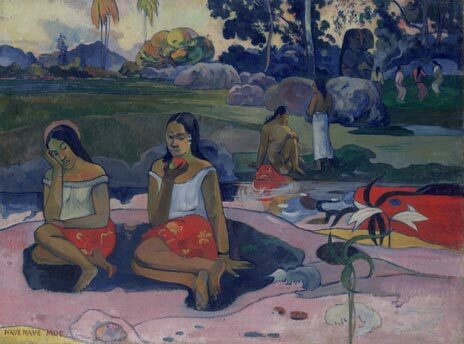 The daring experimentalist Paul Gauguin became their inspiration, pointing them toward a new way of seeing and painting. The works on display were made between 1890 and the outbreak of the First World War.